The "Burney Buck", is a blacktail/muley cross. McGram won a 1987 Blazer in the Big Buck contest from Winners Casino in Winnemucca, Nevada. 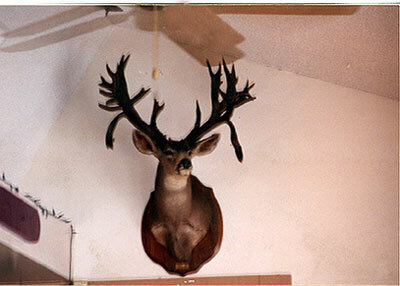 The mounted deer head proudly hangs at his mother's restaurant, BJ's, in Burney, California. McGram is an avid photographer and has taken over 7,000 deer photographs with his 400mm Nikon lens mounted on a rifle stock. Thanks to Bob Edwards for sharing this photo and information.